I took a wee break from nail art this week and, instead, decided to try layering polishes. Usually, I just do one colour and then a sparkle but I thought that I'd up the ante, people. Spoiler Alert: It turned out really well. One coat of Grape Juice, followed by one coat of Ivy, and then Divine Swine. For the feature finger: one coat of Immortal, followed by one coat of Whirled Away, and then Collage Overlay. Guuyyyyys. The combo of Grape Juice, Ivy, and Divine Swine is the most multidimensional colour I've ever seen. For reals. This is an UNTOUCHED photo, aside from the vignette around the edges. It's seriously that sparkly in real life and I'm in nail polish love. 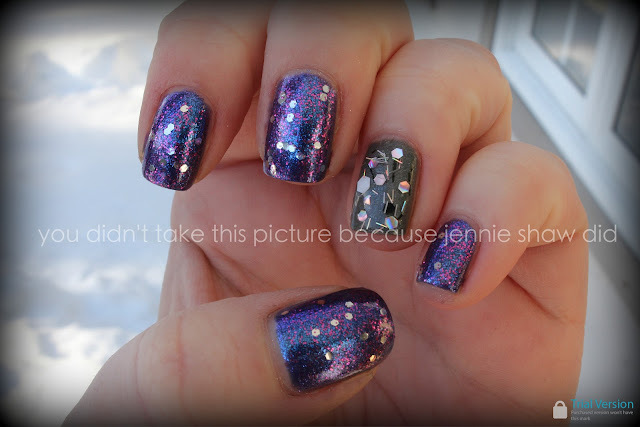 As to the large sparkles in Whirled Away and Collage Overlay, it took two additional coats of top coat to not feel the edges, which basically means that my feature finger took TEN YEARS to dry. Okay, so it wasn't actually that long but it sure felt like it. That said, this mani didn't chip at all and considering the layers upon layers of polish, didn't take much of an effort to remove. All-in-all, a manicure success!! Haha!! Holy Sparkle Batman.. These came out great! What a great idea to layer, I never would of thought of that. I may have to try this too.. I heart Divine Swine! Love all of the sparkles! Very nice color combos. you are amazing!! the end. These look so pretty together. I've seen the Grape juice before on a blog. I think I have to get it. I love the Collage Overlay!